IAM Local 2740 members employed at the SAPPI mill in Skowhegan, ME overwhelmingly voted to accept a new three-year contract Thursday evening. District 4 millwrights had unanimously rejected a previous offer, also voting to authorize a strike. Negotiators were able to win significant improvements after returning to the bargaining table. The new contract includes a one-dollar increase to the pension contribution, and a significant wage increase of 3 percent in the first year, 2.25 percent in the second year, and 2.5 percent in the last year. Negotiators also beat back an attack on the grievance procedure and an attempt by the company to weaken overtime protections. 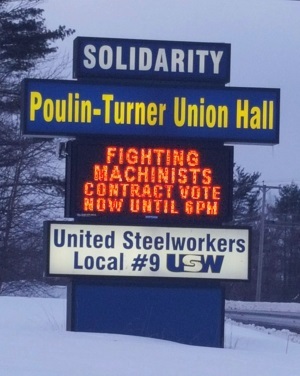 The post Solidarity Brings Gains in New Contract for Maine Machinists appeared first on IAMAW.